ANN ARBOR (AP) — Michigan’s Charles Matthews, Iggy Brazdeikis and Jordan Poole are declaring for the NBA draft, although they can still come back to the Wolverines. The school announced Tuesday that the three players intend to sign with agents, but under new NCAA rules, they are allowed to have agents during the evaluation process for the draft. They can return to school without losing their eligibility. “The new process is a unique experience and one that my staff and I will assist in every way we can,” Michigan coach John Beilein said in a statement. “We want each of them to utilize this opportunity to get more feedback so they can make the best decision possible for themselves and their families. Matthews has been considered the most likely candidate to leave Michigan, having considered the draft last year as well. The 20-year-old Brazdeikis just finished a freshman season in which he led the Wolverines with 14.8 points per game. 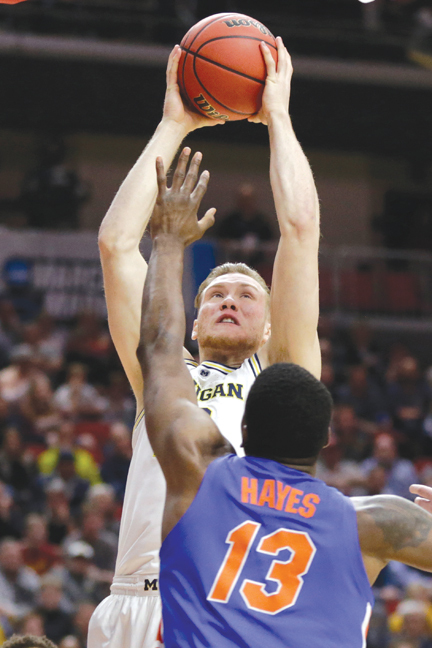 “It was an amazing year for me in Ann Arbor,” Brazdeikis said. Poole, a sophomore, was second on the team at 12.8 ppg, and Matthews, in his third season of eligibility, averaged 12.2. “Being able to play in the NBA has always been my dream since I was young,” Poole said. Michigan made the Sweet 16 for the third straight season but was eliminated there by Texas Tech.